The town of Estes Park has just begun a five-month project that is expected to renovate Dry Gulch Road, the route that leads to Notaiah Road and the start of Eagle Rock’s expansive mountainside grounds. This important capital improvement project is ranked No. 1 on the town’s roadway program and is the first to be funded for work in 2016. And while this reconstruction and rehabilitation project is good news for those of us who commute to campus for work or leave school to visit downtown Estes Park, the construction work will certainly put a damper on our transportation habits. In fact, beginning now and running through the end of August, students, staff and visitors alike will be taking a seven-mile detour to get to Eagle Rock’s entrance at Notaiah Road. The reconstruction of Dry Gulch Road is taking shape in two separate phases, with the first phase already underway with a road closure from U.S. 34 north to Stone Gate Drive. This full closure — as well as the one planned in Phase 2 — enables work to be done in significantly less time than it would take by closing alternate lanes. No firm date has been established for the beginning of the second phase of roadwork. For the past three years, Estes Park has been planning for this $3.93-million project, which includes $936,000 in road repair and expansion, another $1.18 million for storm drain improvements and $1.82 million for trail improvements. A trail connection will be built east of Dry Gulch Road, along U.S. 34, that uses an existing CDOT bridge/culvert to cross under U.S. 34 and connect with the Lake Estes Trail. Driving directions during this five-month period are the same no matter where visitors are arriving from, including Boulder, Denver / Denver International Airport, Ft. Collins or Loveland. 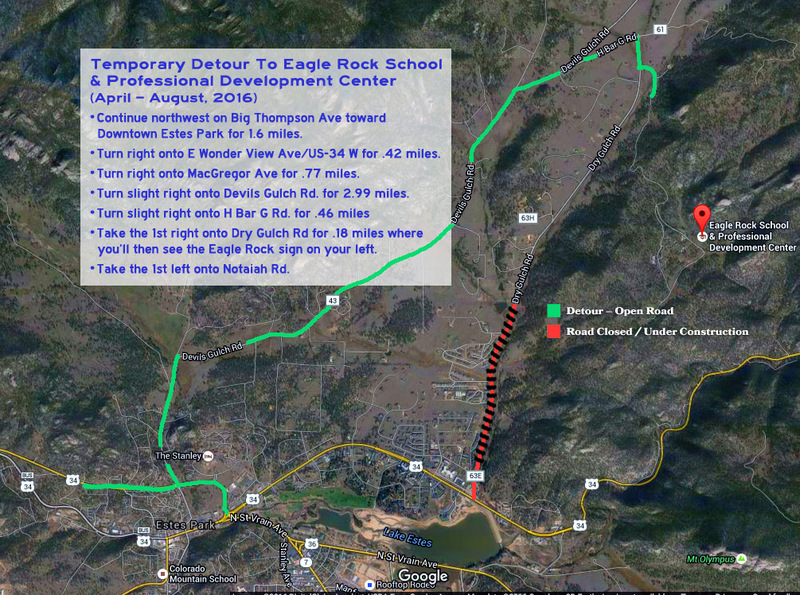 The seven-mile detour takes motorists northwest on Big Thompson Avenue toward downtown Estes Park for 1.6 miles. Turn right onto East Wonder View Avenue/U.S. 34 West for about a half mile. Turn right onto MacGregor Avenue for three-quarters of a mile, then turn slightly right onto Devils Gulch Road. Take that road for three miles before turning slightly right onto H Bar G Road. Travel another half mile and take the first right onto Dry Gulch Road. The Eagle Rock School sign is two-tenths of a mile on the left. Take the first left Notaiah Road. The timeline for construction is month to month but should wrap up by the 26th of August. This entry was posted in News From the Rock and tagged 2013 Colorado Flood, Construction, Estes Park.